Located in the Pilsen neighborhood, El Jardin de las Mariposas brings the culture of the neighborhood into their garden. First occupied by old buildings and then used as a dumping ground; two members of the Pilsen Community, Virginia Dan and Teresa Medina, felt that this empty lot had the potential of being turned into green space for their neighborhood. In 1998, Virginia and Teresa gained the support of community members to turn this area into a community garden. With the help of Openlands and Neighborspace, and continued maintenance by members of the neighborhood, the community garden El Jardin de las Mariposas began to blossom. El Jardin de las Mariposas not only originated by members of the community, but the garden symbolizes many aspects of the community as well. The garden name acknowledges the monarch butterfly that migrates between Chicago and Mexico, which is symbolic of many members of this community. Art work is also displayed around the garden that recognizes the numerous cultures that reside in this vibrant neighborhood. 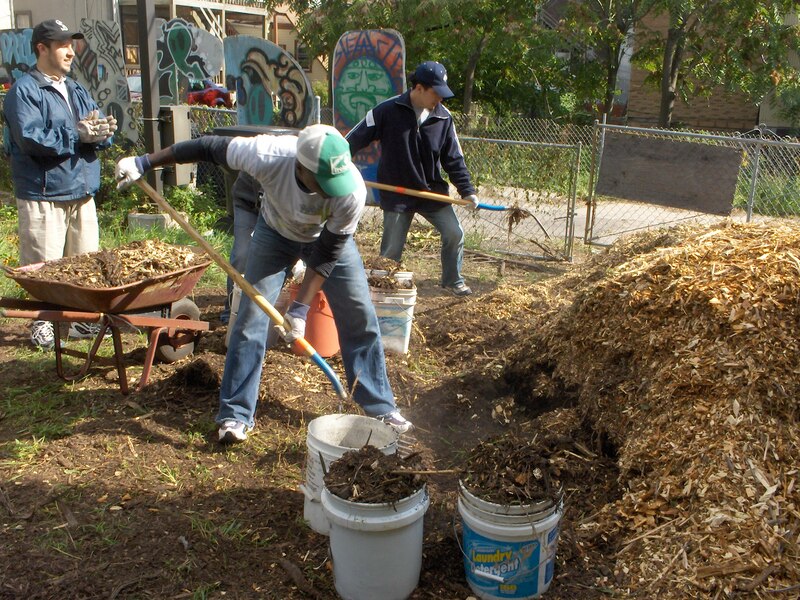 In addition to the continued support of community members, Chicago Cares volunteers visit El Jardin de las Mariposas on the third Saturday of every month. Volunteers attend to the basic garden needs and assist with a variety of projects that can range from cutting back shrubs and native grasses to weeding flower beds and maintaining the walkways around the gardens. We hope you can join us in sharing the natural beauty and community connection experienced at El Jardin de las Mariposas. Our next project will be held on Saturday, April 21, or you can find us in the garden on the third Saturday of each month. Today’s post is from Human Services Coordinator, Aly Moser.